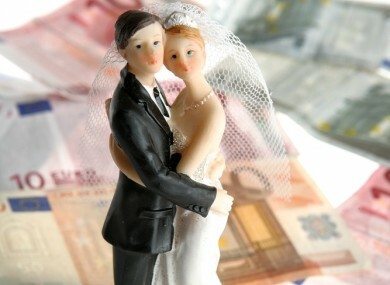 IRISH COUPLES ARE still going all out when they get married, spending an average of €19,625 on their weddings last year. In 2012, the spend was €17,690 so it looks like people went a little bigger last year. A survey by Mrs2Be.ie of almost 2,300 brides and grooms found that, including the honeymoon, people spend an average of €24,045 on their marriage. Though the spend has increased for the venue, band, dress, stationary, transport and the all important honeymoon, the survey showed a slight fall in other areas like photographers, videographers and wedding DJs. Last year, couples were in more of a hurry with the majority of engagements lasting 13 to 18 months before they got hitched, down from two years or longer in the previous survey. Almost one in four couples also live together for more than five years before getting married. The most popular month to tie the knot is December, followed by February and the typical number of guests for the wedding meal is 101 to 150. Email “Irish couples spend an average of €19,000 on wedding”. Feedback on “Irish couples spend an average of €19,000 on wedding”.